Over the last decade or so Volvo the Swedish brand has pushed though the ranks manufacturing more luxurious cars than in the past. Volvo has made great progress with the quality of their vehicles, and now they are officially a premium marque. The S80 saloon is an important model for Volkswagen, despite the small numbers that will be sold in the UK. The previous generation S80 still represented the down to earth practicality of the firm, but the new S80 represents the company’s new commitment to quality and refinement. The S80 is a pretty convincing package. The new S80 is far more elegant than its predecessor. The S80 effectively hides its large size, thanks to a clever body design, and the smart placement of the car’s lights, grille and glazing. Inside, the S80 is well constructed, and the company’s attention to fit and finish has resulted in a luxury ride that will please even the toughest of critics. Some interesting combinations of wood, plastic, chrome and leather are available. Diesel-engined models are likely prove to be the most popular in the UK. The V8 will likely provide loads of fun, yet it is not likely to be fuel efficient. The best choice is the petrol 2.5-litre turbo. The S80 isn’t too expensive when compared to rivals of the same class. Although the asking price is a bit hefty, insurance rates and servicing charges are low, and fuel economy should be good.The cabin is spacious for a saloon and will provide sufficient space to all of the occupants, though the rear passengers may complain on long journeys due to a lack of legroom. The gauges are clear, concise, and well located. The fascia is uncluttered and the controls are functional as well as practical. The switchgear is of high quality as always, though some may complain as it lacks color and is uninspiring. Passengers will be comfortable both up front and in the rear as long as you don’t embark on a lengthy journey. With plenty of head and legroom in the front seats, there shouldn’t be any complaints. Accessing the cabin is easy, and though the doors do have large apertures, passengers will have to stoop a bit. The boot is easy enough to access, though the lid is slightly heavy and an automatic opening system would have been appreciated. Parking the S80 is easy for a saloon. And even though it is a larger car, The S80 has a tight turning radius and light steering. To further aid in parking confidence, sensors are included. The Volvo S80 delivers a swift and smooth ride. 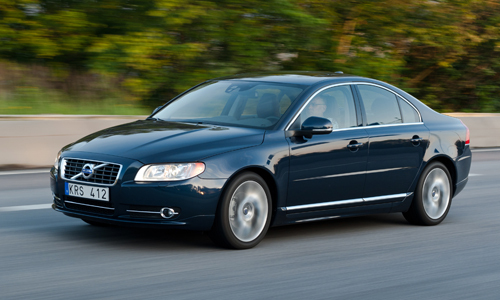 Driving the S80 is a relaxing experience that can be compared to that of much more expensive and premium brands. The S80 can go fast, but for some people it just seems disrespectful to the brand to think of it in terms of aggressive driving. This is not meant to be a family vehicle. It could transport four people comfortably, but was designed to transport four adults, not children. The car’s leather upholstery is not child-friendly and will not fair well at the hands of children. There are other more appropriate vehicles available. This expensive and rather powerful saloon would not make a good first car. The S80 does not have much appeal for newly licensed drivers. It will appeal to a more mature crowd. Volvo can produce a very desirable high quality product, but the fact that the S80 shares many components with other Ford Group products such as the Mondeo and S-Max may make buyers wonder if it is worth such a high asking price. Buyers will not have to wonder long, because one look at the car’s interior and one test drive and buyers will be sold. Volvo’s Personal Car Communicator (PCC) is similar to a conventional remote control. The PCC can tell if the car has been left locked or unlocked, if the alarm has been activated and uses a sensitive heartbeat sensor to tell if there is anyone in the car. It can access this information when it is within 100 metres of the car, and stores the most recent information so that the driver can check to see if the car was locked when it was parked. Volvo’s security system is top-notch. The car’s safety features include the Blind Spot Information System, which simply flashes an LED by the wing mirror when a car is in your blind spot. The system has a few glitches and the company will more than likely address these issues rather quickly. The car’s standard audio system includes an 80W system with a CD player and six speakers for S models, rising to 160W with a six disc CD changer and eight speakers for SE models and above. The optional Dynaudio Premium Sound audio system is the top of the line and will please audiophiles. All systems on offer provide excellent sound quality. Leather upholstery is standard for SE models and above. Surprisingly, it is the modern black and chrome combination that is the most flattering in the car’s interior. Darker exterior colours are most flattering to the car’s exterior design. The S80 is a refined car meant for mature tastes. Buyers are sure to make a positive impression at work or play with the executive saloon.